AFC - 05/29/13 Abolish Incentives For Animal Breeding! 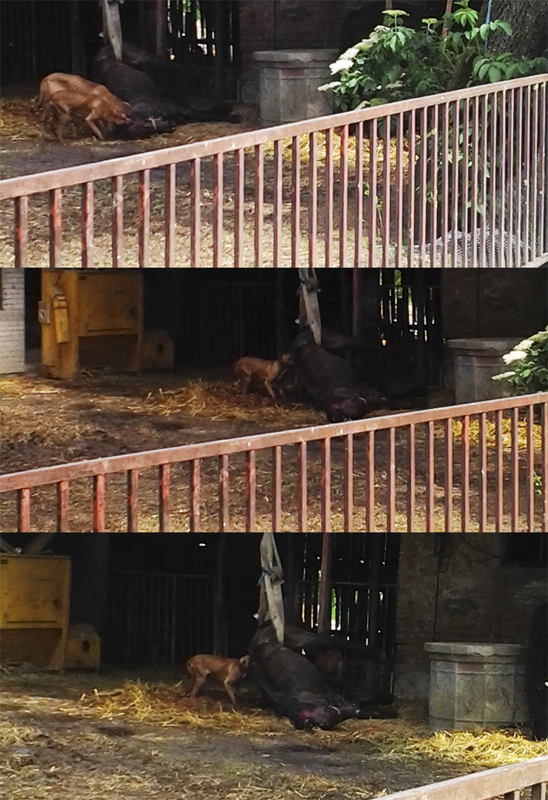 Following the case of horror on farm near Ivanic Grad, Animal Friends demands: Abolish Incentives For Animal Breeding! The recording taken from the farm of Branko Borkovic in Precno near Ivanic Grad, where you can see starving dogs attacking a dying horse, horrified many citizens who contacted Animal Friends asking for urgent help for the animals on the farm thus sanctioning Borkovic for neglect and animal abuse. The eerie recording lasting almost nine minutes, made a week ago and published on the internet, shows hungry dogs whose ribs are visible, attacking and eating the insides and neck of a horse who, although half bent and hung, is still alive, and is screaming whilst furious dogs tear him apart. The sick horse was tied with a fire hose, obviously to stop him from lying down. According to citizens' reports, this is no isolated case, but Borkovic who is also the president of the Central association of breeders Hrvatski Posavac, has been breeding horses for the last fifteen or so years only because of government incentives. Neighbors report that over longer periods dogs, horses and other animals on the "torture farm" have been neglected, malnourished, starved, sick, often freely roam the area destroying the neighbors' crops and die of starvation. Even though they had dozens of times called the veterinary inspection and the police dozens of times, the authorities have done nothing to stop this animal torture. Even though the scale of animal neglect is horrible, this is not the first such case in Croatia. Neglecting and animal abuse on farms that receive government incentives have become regular practice, where the implementation of the incentives is regulated very poorly or not at all. Cases like hundreds of cows dying from starvation on Lonjsko polje near Sunje in 2010 due to neglect or on the farm Lov Farma in Josani near Udbina a few months ago due to hunger and neglect, are just some that reach the public focus through media because of the horrible consequences. There are many more cases where animals daily suffer due to hunger and neglect, and nobody knows about them and nobody can help them. Animal Friends will react in the case of Branko Borkovic farm by writing to all the relevant institutions, asking for urgent animal seizure and sanctioning Borkovic for violating the Animal Protection Act, the Criminal Code and other legislation, requesting monetary and prison sentence. We will send a request to the Ministry of Agriculture to investigate all the farms that received incentives in order to determine the situation that animals are in and seize all the animals from those who misuse the opportunity to receive the incentive and government land. Also, as the Ministry of Agriculture obviously has no means to control the situation on farms and implement the legislation referring to animal protection, Animal Friends demands that incentives for animal breeding to be abolished.